After the sudden death of the ugly 7,92 x 24, VBR of Belgium is back. A new cartridge and a new pistol made in Italy. is an 1911/ Beretta derivate. The 7 mm Penna familiy of cartridges is not especially new. 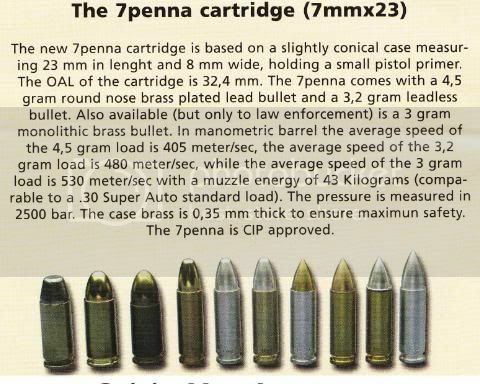 We reported on this ammunition in Issue 440 of the International Ammunition Association Journal, November/December 2004 issue, and had the specimens shown in the article at hand a month at least before that. Reference: Above noted Jounral, “7 mm Penna Family,” John L. Moss - Woodin Lab, pages 43 to 45. Little is heard about this wannabe PDW caliber in recent times. Is it dead? The first one is no longer produced since even revolvers chambered for the 7 mm Penna use the rimless version. They are still promoting the long case (28mm) version but I think they’ve only used test barrels - no mention of a gun for it. even dictated ammo design today. High performance with low recoil AND vest breaking. These words shall remain us about so many other “wonder weapons” and calibers which disappeared in history.